The RL-RF210 is a sleek and unobtrusive Foxtel-compatible flat IR target for use in a ZyCast RF-IR video distribution system that includes an IR modulator or video hub emitter. 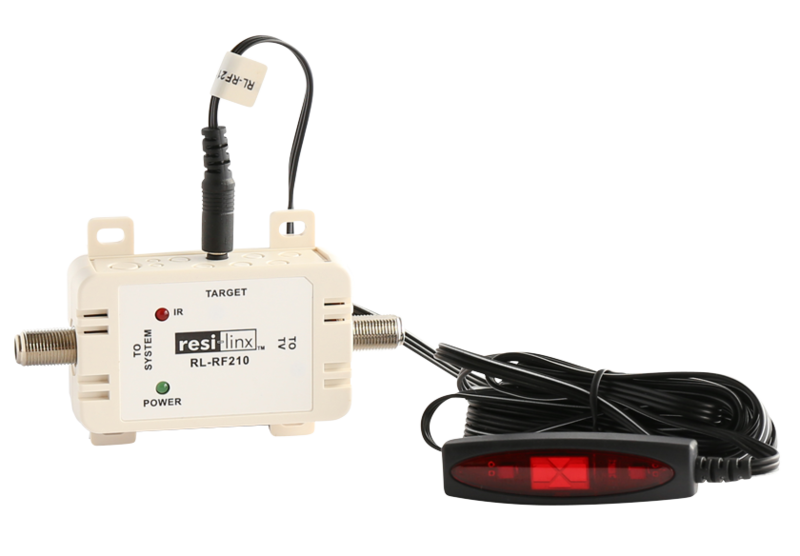 The target receives IR commands from a remote control and sends the signal through the RL-RF380 video hub and emitters to remotely control an AV device. The RL-RF210 is plasma and LCD TV-friendly and Pay TV-compatible. The target plugs into a compact, mountable in-line coaxial connector box using 3.5mm mini-jack. To facilitate placement, adhesive backing is included in the kit for the target as well as the connector box. Powered remotely by a modulator, a flexible flat cable allows easy placement of the target. The RL-RF210 rejects interference from plasma displays as well as direct sunlight and fluorescent tube lights for accurate IR signal reception. A built-in LED shows acknowledgement of IR commands.